With so many like numbers I had to use another decimal value to correctly match them, thank you for checking my work. I assume the small changes to emps cd value makes us much closer? Not just CD changed. All the values changed for emps as they are calculating 266 PR instead of 266.66666. The PTS table is a tab over, I will update that to be the main one after the update rolls out. After changing from 266.66 pr to 266 pr per major boost, I get 164573.2 MD and 2246.24 CD. On my list, 5/4/10/8 + 1/2/3/3 is rank 31 and can go to rank 2 when cosmic gems get a 10% bonus. We're the same on MD then, I omit the decimal from view to avoid confusion, I roll off the hundreths value on CD otherwise it's same except but we're 2CD full apart for some reason. I have 385.7 for 'equipment' (basemd+sum of dragon buffs+sum of hat/face/wpn, 75+82+228.7) and then the rest is gems, I use 90.2 for CD base and 53.2 for each emp boost, 77.0 and 40 for lessers. 385.7+1391.9+470.6, 2248.2(4) ... ? what's your CD boost number? We have a different sum of CD from dragons. I get 80 = 3 + 3 + 3 + 3 + 5 + 5 + 8 + 10 + 10 + 10 + 10 + 10 from Jhorondir + Tanbleddyn + Tysorion + Wyntegra + Cy and Sanguine + Glittering Prize + Carys + Flakbeard + Indurion + Sarsaponia + Vile Guidance + Yorinn. They adjusted Jhorondir during PTS and I didnt catch that, I was going off by old strings prior to PTS. 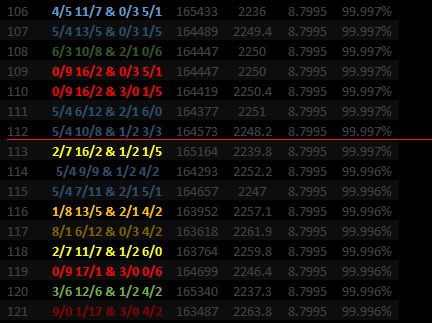 5/4 10/8 1/2 3/3 is hovering at rank 114 now though, how many combinations do you calc for? I do 7 for the cosmic lessers * 4 comsic emps * 19 elemental lessers * 10 elemental emps, 5,320 combos. Would you happen to know any shortcuts to trimming such a list? perhaps it's a sort of largest 4/5 9/9 is the best 4/5 9/9 so exclude others? Yes, there are a total of 5320 combinations and I rank all of them. 5320 is a small number for a computer, so the calculation should be instant if you use the appropriate data structures and algorithms. My other lists could be simplified by considering groups of combinations where the only difference is +3/-3/-4/+4, but now it is more complicated because of not having +10% bonus to cosmic gems. I'm considering using google sheets to display all combinations and color coding by probabilities. 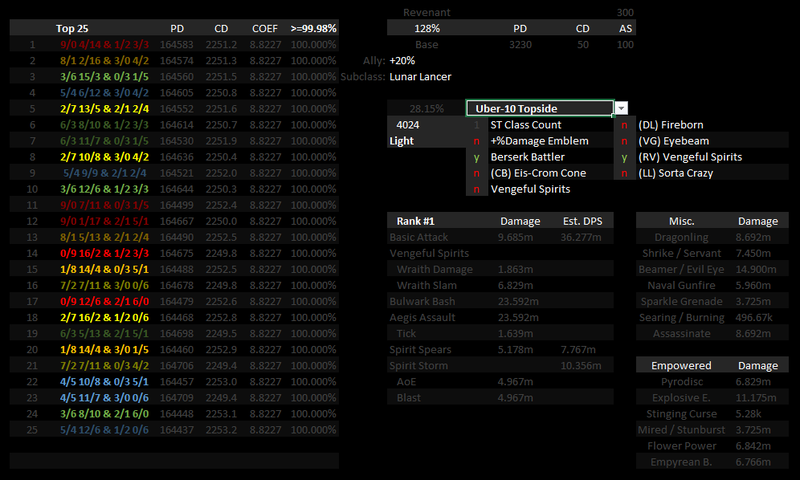 If the coef mod goes off the UI numbers I could see why there may be a variance with the rounding ingame vs sheet numbers, and why I thought my previous rankings (prior to cosmic gems) were correct when compared to the coef mod ingame. Later on to discover I was off by +-1MD or -0.1% ingame using diff layout combinations, which explains that for me (rounding in action). Incase anyone reads this and thinks rank 31 sounds low, there's like 68 ties within a 0.0000 range, the numbers are so tight now. Prime/Elemental, Shadow Towers, and Topside (Light) are now included. An Excel 2016 user said >=% wasn't working for them however I couldn't reproduce it in 2013&365. Theirs didn't like 99.999../100 and came up with a #value error when Evalute Formula was ran. I wrote a Tips tab just in-case, but if you'd like some help pm me or write here. Someone elses post reminded me dots like Searing/Burning don't crit so I've adjusted that, but before I post it was there any other requests by the ~20 people who checked it out?